Do they hold you down? Do you scream out loud? Here’s something to look forward this July! Joshua Ketchmark, born in Illinois, found his way to the Music City to hone his music. With a guitar (and some more) on his hand, Ketchmark has been able to write songs that give a glimpse of serenity to the downhearted ones. His ability to write songs with raw, authentic sentiments draws audience to a realm of vulnerability and nostalgia. Whether you’re looking back or pushing forward, Ketchmark’s eclectic musical style would be a great companion to get there. His second and upcoming EP, ‘the Dreamers Disease’ features four alternative country songs about a life of great expectations. While “Saving Grace”, a song for the dream chasers, features funky guitar melodies, the second single “Mason Jar” has a more electrifying composition with guitar solos fired up and Ketchmark in Kravitz mode. The two tracks “Should Have Been,” a bittersweet love song and “Step Back,” a rock ballad about self-discovery, are both engaging with beautiful phrases, subtle riffs, and enflamed vocals from Ketchmark. Ketchmark is releasing three EPs this year. His first EP “Bittersweet” was released last April 17 and showcased Ketchmark’s eclectic musical influences. The EP received outstanding reviews and was another success for Ketchmark and his team. “the Dreamers Disease” EP is set to hit the streets on July 17th, 2012. Produced by Kenny Wright, and recorded at 1 Tree Studio in Nashville, “the Dreamers Disease” also features appearances from Nashville players such as Tony Paoletta (Pedal Steal; Dixie Chicks, Travis Tritt) and Dave Webb (Bass; Randall Bramblett, Sugarland). You can check out JoshuaKetchmark.com to get Joshua Ketchmark’s latest updates and upcoming shows. You can also visit his Facebook Fanpage, follow him on Twitter or listen to his tracks at MySpace. Watch Joshua Ketchmark’s music video for his single “Cigarettes & Wine” from his first EP ” Bittersweet” to get a feel of Ketchmark’s musical style. JOSHUA KETCHMARK SET TO DROP “THE DREAMERS DISEASE” EP ON JULY 17TH, 2012. Fresh off the success of his EP “The Bittersweet,” Joshua Ketchmark is set to release the alt. country-rock style EP titled “the Dreamers Disease” set to hit the streets on July 17th, 2012. “the Dreamers Diseases” is the 2nd EP in a series of 3 that Ketchmark will be releasing in 2012, glittering with a heavy alt-country influence that is tangled with and inspired by summer days full of wanderlust, he finds a remarkable comfort in the raw, organic aesthetic. Produced by Kenny Wright, and recorded at 1 Tree Studio in Nashville, “the Dreamers Disease” features Joshua’s eclectic and nostalgic songwriting talents, as well as appearances from Nashville players such as Tony Paoletta (Pedal Steal; Dixie Chicks, Travis Tritt) and Dave Webb (Bass; Randall Bramblett, Sugarland). Inspired by short-lived romances and fervid moments when your childhood crashes head first into adulthood, “the Dreamers Disease” will capture the attention of youthful dreamers and hopeful wanderers alike. The first single off ‘the Dreamers Diseases’ “Saving Grace” is your quintessential summer anthem. With a Bon Jovi-inspired feel, Joshua’s lazy southern drawl fills in space between the rambling guitars, bringing back memories of road trips with the wind in your hair and music filtering in with the sunlight. “Mason Jar” is infused with electrifying choruses and explosive guitar riffs, with a Lenny Kravitz feel and attitude that immediately gets your pulse going. On “Should Have Been,” Joshua captures the bittersweet emotion wrapped up in the romance that could never be, emotive vocals layer over the melancholic steel, his lyrics have the distinctive ability to find common ground between hope and regret. “Step Back” recalls the tumultuous journey of self-discovery, on a ballad that meanders gently through the heartache, the lack of bells and whistles translates the subtle comfort in having someone to lean on. Joshua proves his strengths in the the telling of each story, the instrumentation constructed in a way that inspires perfect visual memories of youth, from the slow pull of the steel pedal to the rushing acoustic guitar. Joshua Ketchmark continues to expose all the unique facets of his musical personality on ”the Dreamers Disease,” sure to draw listeners in and leave them anticipating what comes next, and defining him as an ever evolving talent. Following up the success of his last EP Bittersweet Joshua Ketchmark is set to return with his new one Dreamers Disease on July 17th. This is the second in a trilogy of releases that Joshua will be giving us this year. The four track EP kicks off with ‘Saving Grace’ a perfect summer anthem with crashing guitars complimenting Joshua’s lilting voice. The second track ‘Mason Jar’ is by far the standout on the short set this one is full of attitude and you really get a sense of Joshua’s anguish as he sings ‘I foresee she’ll be the death of me ‘on the captivating chorus. ‘Should have been’ is more melancholy after the excitement of the previous track here Ketchmark’s voice is dripping with emotion as he laments the breakdown of a relationship. The lyrics are impressive too displaying an innate ability to masterfully tell a story that will captivate and inspire listeners. The closing track ‘Step Back’ is about the journey of self-discovery that we all go through it’s a brilliant ballad that make listeners relive their youth no matter how old they are. Joshua has proved himself a wonderful storyteller and impeccable vocalist with the Dreamers Disease it will draw listeners in will definitely set him apart and enable him to make his mark on the music world,with a third EP coming before the year is out it looks like the best is yet to come from Joshua Ketchmark. In March 2012, singer songwriter Joshua Ketchmark released ‘The Bittersweet’, the first of a proposed trilogy of EPs. Produced by Denny Smith, the release showed off Ketchmark’s abilities to lay down enjoyable hook-laden tunes in a radio-friendly pop-rock style. His second EP, ‘The Dreamers Disease’, again focuses on hook-laden tunes, but is by no means just a retread of the previous release. Smith’s place in the producer’s chair this time around has been taken by Kenny Wright (also of The Great Affairs) and Ketchmark’s decision to bring in a handful of alt-country session guys means these four songs are sometimes presented with more of a rootsy/country rock groove. ‘Step Back’ combines a country rock ethic with the presence of a power-ballad. The verses are structured around acoustic guitar lines, over which Ketchmark appears in rather fine vocal form. For the chorus, things shift up several gears as heartfelt song writing comes blended with a stadium rock intensity. All the while, the country-rock elements never seem too far away, with a steel guitar (played by Tony Paoletta) lurking in the background. ‘It Should Have Been More’ – a roots-rock arrangement again augmented by steel guitars – is the EP’s strongest offering, and while the arrangement at first sounds relatively simple, closer listens reveal some great touches mandolin, (courtesy of Bonepony man Nicolas Nguyen). While the lyrical themes of regret are well worn, Ketchmark really excels vocally – an absolutely first rate performance. Musically, it could be described as Bon Jovi (circa ‘Endless Highway’) as played by Ryan Adams & The Cardinals in a tough mood. Although such a flippant description does not really do this track justice, keeping that in mind, you should at least get a hint of what to expect. The EP’s “odd man out”, ‘Mission Jar’ is far more aggressive. Although it doesn’t quite fit the alternative rock moods of Ketchmark’s previous EP, it doesn’t really have a comfortable place here either. The rhythm guitars lay down a scratchy tune, angular but not quite settling into the funk groove it half-promises, while the lead guitars are surprisingly upfront. It is an interesting number on which Ketchmark sounds vocally cool, but it is a tune which, maybe, ought to have been left on the shelf until a more fitting home became available… The single release ‘Saving Grace’ is a slice of upbeat pop/rock on which the blend of acoustic and electric guitars meshing well, while some old-school organ (played by Lynyrd Skynyrd’s Peter Keys) recalls The Wallflowers. A slight mood change for a big chorus leans more toward a New Jersey sound and, after a couple of spins, it is so obvious why this was chosen as the lead track. Its goodtime, optimistic qualities and another strong melody makes it ideal for radio. Those who enjoyed ‘The Bittersweet’ EP and Joshua Ketchmark’s previous releases may find ‘The Dreamers Disease’ a little less instant, but once again, his gift for song writing often wins out. The EP’s two strongest tracks (the wonderful ‘Should Have Been More’ and ‘Step Back’) are enough to recommend this release…and if you dig those, that could just enough to make you wish this had been a full-length disc exploring similar styles. 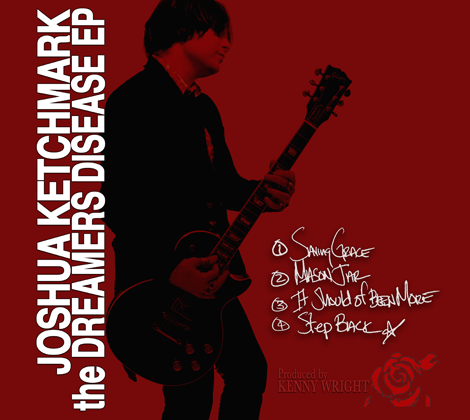 “Dreamers Disease” is the second release within a series of three EPs being completed by modern rocker Joshua Ketchmark. “Dreamers Disease”, dropping July 17, exudes more of an alternative country-rock feel, underscored by the Nashville flavored track, “Should Have Been”. The EP was recorded at 1 Tree Studio in Nashville and features appearances from Nashville players such as Tony Paoletta (Pedal Steal; Dixie Chicks, Travis Tritt) and Dave Webb (Bass; Randall Bramblett, Sugarland). Inspired by short-lived romances and fervid moments when your childhood crashes head first into adulthood, “the Dreamers Disease” aims to capture the attention of youthful dreamers and hopeful wanderers alike. The first single, “Saving Grace” is a summer anthem begging to be played on your next road trip. “Saving Grace” is laced with Bon Jovi influences, sounding like a leftover track from their “Lost Highway” sessions. “Mason Jar” is not as accessible in the melody department, but is a potent riff-oriented rocker in the style of Lenny Kravitz. As mentioned, “Should Have Been” is the song with the most overt country influence and this mid-tempo treat has a very satisfying hook. “Step Back” closes this EP with a breezy ballad that begins with some gentle strumming before expanding into an emotive epic. Joshua Ketchmark is ready to embark on a three-city tour in support of his newest EP “The Dreamers Disease”. His newest album, an alt-country influenced sound straight out of a Nashville recording studio, is the second in a series of three releases due out this year (the first being the EP “The Bittersweet”). Recorded at 1 Tree Studio in Nashville and produced by Kenny Wright, it features Joshua’s trademark songwriting talents and appearances from famous Music City players such as Tony Paoletta (Dixie Chicks, Travis Tritt) and Dave Webb (Randall Bramblett, Sugarland). “The Dreamers Disease” is album full of youthful exuberance, a quintessential summer soundtrack that is only heightened by Joshua’s raw, organic aesthetic as he weaves picture perfect stories of short-lived romances and childhood dreams. Following the release of the album, Joshua will begin his tour at the famous Viper Room in Los Angeles, on July 25th, taking energetic and unique sound to the stage in support. His storytelling and eclectic mix of music translates perfectly to a stage setting, allowing his powerfully emotive music to express the carefully constructed lyrical stories in a way that brings them to life in front of the audience. His tour continues with August dates which include Genghis Cohen (Los Angeles, CA) on August 17th, The Rutledge (Nashville, TN) on August 24th and The Preservation Pub (Knoxville, TN) on August 25th. Joshua Ketchmarks powerful mix of alt-country and rock music is a must-see for any fan of authentic and organic music; and his genre-defying style makes him a treat for all listeners. Take what you love and make it your life. That phrase comes to mind when I think of writing the song “Saving Grace,” from the Dreamers Disease EP. I grew up in a small town in the middle of Illinois. I wouldn’t trade it for anything, but I think I knew early on it wasn’t where I’d settle down. As soon as I had my chance I took it, and with that came the experiences and the characters I would fill my songs with to this day. “Smokestacks on the skyline,” the opening lyric, is the most defining memory I have of leaving all I knew for the unknown. It was a rush of excitement in a breath of uncertainty. It was the defining moment when you realize what’s possible in life. That instance you throw caution to the wind and follow your heart. As taillights set ablaze to the morning light your on your way. Looking more at what’s to come then what’s left behind. Catching the occasional glance in the rearview, your eyes give all the reassurance you need. If you could sum up the instant, evening or event that changed everything, what would it be? And if not, what are you waiting for? It’s not too late for saving grace. Let’s leave it all behind, there’s no time for long goodbyes. Got to make it out alive. Follow your heart.